Well, we're all set to go tomorrow morning. it took me longer than expected to get my (greg's) stuff together, and i just finished throwing this program together - i hope it works the whole time. Anyway, Mike and I are rearin' to go! We had a rockin' going away party friday, most of which I don't remember. I blame the spiked watermelon. Hey All - We're in Eugene, OR at the lovely University of Oregon Library. Unfortunately, the computers here are all locked down, so no photo uploads. Also, apparently the limit for cell phone text messages is shorter than I thought, as the cut-off previous postings will attest. Anyway, we're waiting as greg's rear wheel gets rebuilt with stronger spokes by the helpful, friendly people at the Blue Heron bike shop. He busted a spoke on a downhill yesterday (luckily, we had a temporary spoke replacer - kevlar to the rescue), and he doesn't want to have to worry about that stuff anymore. It's too bad we can't upload pictures so you can see what our bikes look like, but rest assured - they are HEAVY. Yesterday was a good run, considering the late start we got (time spent with master Raymond is time well spent indeed.) We met a nice guy at the Green House Cafe in Walton, whilst eating delicious asparugus and leek soup - the perfect food for the occasion, as it has been somewhat chilly and damp here in the Beaver State. Things were going well (aside from the slight setback of the broken spoke) until greg began to develop a strange pain in his knee that continued to increase until even walking became difficult, prompting an early stop to our journey. The pain was gone this morning, but reapearred as we neared Eugene. Hopefully, it is the type of thing that will go away with time - otherwise we will be forced to ship greg's lower leg home along with other bulky, obsalescent items. It should be noted that the last time I felt this pain was while snowshoeing with Nick Raymond in Yosemite - perhaps it is an ill-intentioned going-away present from the Tall Man? Because we bedded down at our secluded, but technically illegal, roadside wake up at the crack of dawn this morning, and accomplish the amazing feat only ones present to witness this spectacle could do nothing but emit an annoyed "Baaaaaahhhh!" Well - that's it for now. 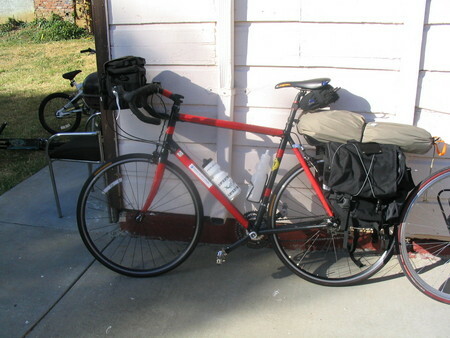 Sally the Spokester should be finishing up my rear wheel about now, and then we must continue our eastward crawl. I was checking the maps, and either today or tomorrow we'll have our first real climb - about 4500 feet. Hopefully, it won't kill us. Made it over 5200' pass. Beautiful scenery. good weather. nice people. this is fun. Okay - let me try and briefly update you on what's happened since Eugene (those posts from my phone are almost too short to be worthwhile.) So, my wheel with the new spokes is rollin' fine - the folks at the Blue Heron bike shop are great - they rebuilt the wheel in an hour, and only charged me $40. So far, that has been the only mechanical problem on the trip (besides my derailluer getting a bit bent from my bike falling over - easily bent back though). My knee problems went away after readjusting the cleat on my shoe (though new pains are arising in my knee, as well as mike's). Ummm - We spent the night after eugene at the swimmin' hole in Vida, pointed out to us by a local after we came across a sign warning that the area was patrolled by "25 Giant Leaping Frogs". From there, we followed the river up to the McKenzie Pass - about a 4500 foot climb, at the top of which we met two cool, cute, intelligent girls who were chronicling the lychen development in the area. Jill rode her bike across new zealand last year, and we traded tales of woe and conquest. In the morning they left us with mexican hot chocolate and a lovely letter. After finishing our first big climb, the ride down the other side of the mountain really whet our appetites for more-- every up has a down, and flying down a mountain at 35 mph on a bike for 10 miles is one of the most amazing things ever. 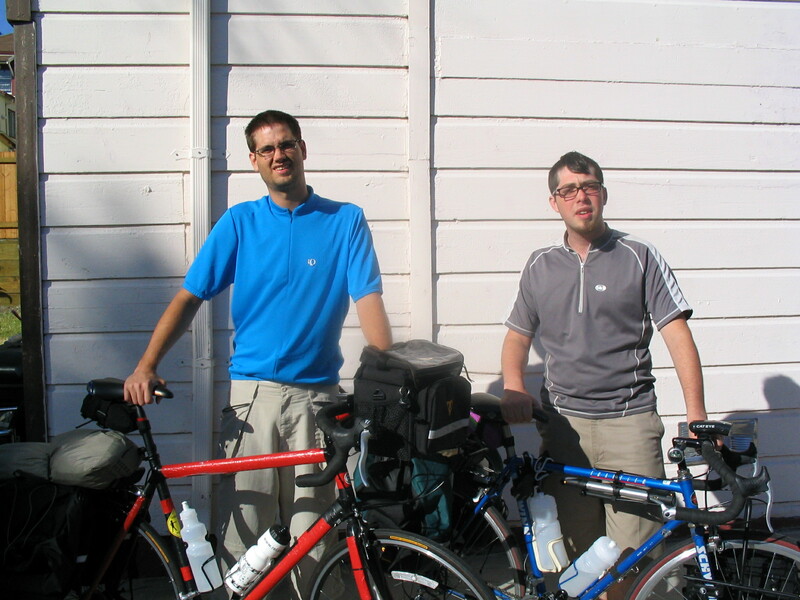 In Sisters, OR, Mike sent his bike seat back home and bought a new one. He also asked the kook in the local bike store to have a look at his rear derailler, which was having trouble making it all the way out to high gear. The guy played with it for a moment and told Mike to throw the derailler away and buy a new one for $70. He said he didn't have the parts or tools to fix it, so Mike took the bike from him and fixed it with some chain lube and his fingers. Leaving Sisters, we had a phenomenal tail wind and shot all the way into Redmond at about 22mph. Enroute we met a wirey old dude on a mountain bike who would've been more appropriately clothed in a loin cloth and a leather bladder to carry his water. He went to great lengths to get us to go back with him to "his" campsite (to the extent that he began making things up that weren't on the map), but his route would've taken us way out of our way, so we continued on east. In Prineville we had a beer at a basement lounge, and met a guy who did carvings and sculptures inside of burned out lightbulbs. He had a real knack. Greg talked to a guy who at one time owned the seven biggest car washes in Los Angeles, was a millionaire at 27, and is now trying to rent out one of the rooms in his condo for extra money. Outside Prineville we met Chet, a burley Vietnam-vet biker dude who'd been prescribed copious amounts of medicinal marijuana for his glaucoma. We traded bike stories-- he owns about 125 bicycles, most of which are old Schwinn's and rehabs. He'd also had a hand in making some tallbikes, swingbikes and choppers, and I promised to send him some Rat Patrolpropaganda when I got back. Mitchell might as well have been a ghost town, and was overrun with vet bikers. We met a 70 year old federal judge there who's doing a similar bike trip to us, and is on his own. In Mt. Vernon we walked into an antique store just to nose around. There were a few mandolins hanging on the wall, and Mike started fiddling around with one of them. The owner of the place, Tommy Tucker, promptly told him, "That's not a mandolin!" Then he went into the back room and brought out one that had been handcarved by a friend of his in town. He gave Mike the mandolin and we wound up jamming for about three hours, during which time his wife, Vivian, and another local guitarist, Tommy Whale, all came in to lend a hand or a voice. We've got some of it on Mike's dictaphone. In Prairie City we stayed with a 20 year old kid whose parents' owned The Branding Iron. They had a hot tub overlooking Strawberry Mountain, and we listened to each others' homemade music. The only way we could get him to play his music (he's recorded over 120 songs that apparently few others have heard) was to play him some of The Food Brothers. His stuff was really good-- very mellow, kind of Tortoise-esque mood instrumentation. We had a hard ride yesterday and wound up in Baker City, where we meandered trying to find a squat or a campsite, talked to the street toughs in the park, the soon-to-be-sorority types at the local microbrew, and finally ran into another guy on a bike who was following the quickly-pinkening sky for a photo. He had just bought a new building (with two empty apartments), so we had an entire place to ourselves for the night. 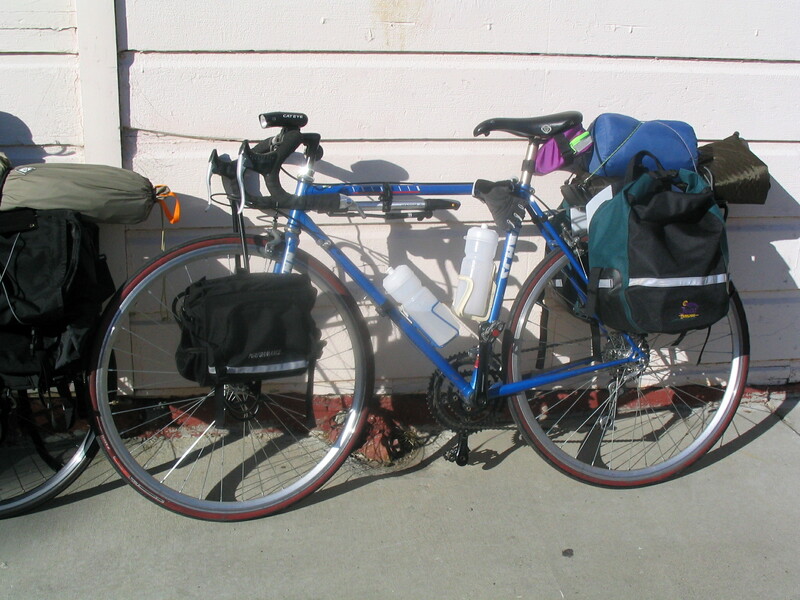 This morning we learned that he's ridden his bike from California to Alaska; Pennsylvania thru the south to Washington; and has hiked around the entire coast of New Zealand using no roads or trails. He was a fugitive in New Zealand for a time, having overstayed his visa and gone into hiding for several months to avoid being deported before finishing what turned out to be a two and a half year trek. The pancakes he made this morning were out of this world, as Mike's mom would say. He said we could stay again tonight, but I think we're Idaho bound. Okay, that may be a lot to absorb, but I think we're just about up to date. We have yet to ride naked in Oregon, so that is on today's agenda. Thu, Jul 1 @ 4:21 PM - Pictures at Last! Ok - we're at a library and we think we can upload some pics - here's a try. Dipping our wheels (and shoes) in the Pacific. Fri, Jul 2 @ 1:50 PM - More Pics! At the top of McKenzie!